This is some magical liquid which would hurt your skin, but can be inside your veins with no worries at all. The nurse wears thick blue gloves and a clear plastic eye shield. I get a thick piece of gauze to protect the skin on my tummy. The silly version: A couple of the more minor side-effects of the chemo came by this morning just to remind me they’d been here before, when I was much weaker. Their capo famiglia, Mr. Leukemia, was concerned about noticing some armed chemo being around. I feigned ignorance and let them go away. The more descriptive version: I actually woke up feeling fine, but just after my shower (done solo without E having to be here to help me out, like she did for the first month+ I was here—woo hoo!) I realized my tummy was feeling a little upset. About an hour later, around 10 in the morning, it was like someone put a thick winter jacket on my shoulders to weigh me down—fatigue came flying in and hit me with a wallop. The nurses gave me some Motilium which settled my tummy, and as I relaxed and chatted with Elana, I recovered a bit of my energy for the rest of the day. My ability to be sitting up typing this right now, and not crashed out to bed early or done a nap in the late afternoon, are evidence enough to me that something let me get past that, at least for today. I know the fatigue in particular will hang around a bit more forcefully as the next week or so goes by. Each day, we’re asked what we’d like for our dinner (lunch!) and tea (dinner!) tomorrow. 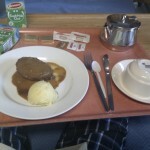 I’ve learned some key tricks, many thanks to Miss M the amazing person who does the catering service for our ward. When she’s out for two days, you really notice her level of skill when her stand-ins make mistakes wide and varied—admittedly, I can only know they’re mistakes because I’ve had five weeks of experiencing the whole process. First insider hint: say “please add ‘with veg’” for every entree you select—for either meal. More than 50% of the time, unless you’ve asked you will not get any form of vegetable with your meal. Seriously. 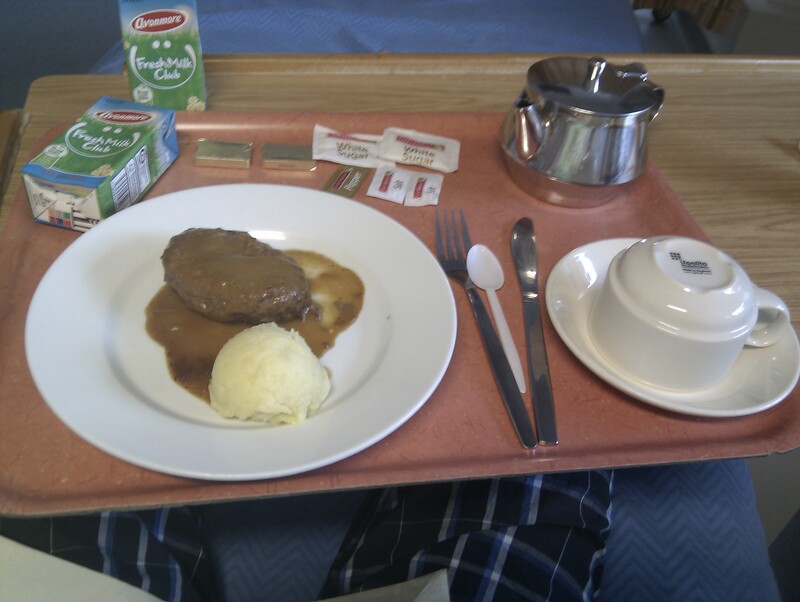 You’d think a place like a hospital would want you to have a nutritious meal. Sometimes the food’s decent enough, other times it’s excessively starchy with little else to hold it up. But at the center of it all is the fact that they don’t think vegetables matter. And, to boot, if you’re specific—perhaps, “with peas”—then you’re screwed completely. Apparently if not enough people ask for a particular vegetable, the kitchen staff effectively say “feck it” (a phrase regularly heard on the radio in Ireland) and not only don’t give you peas, they don’t give you anything at all. Second insider hint: don’t be foolish and mess with what everybody naturally wants. First example: We get offered tea (the drink this time) repeatedly during the day. Or coffee—instant, water-bathed, not-really-dissolved, I-think-it’s-leftover-from-a-meeting coffee. The nice man running around crying out, “Tea?”, reminding me of accordion-playing beggars on a commuter train, froze and gave me a look of sheer contempt. I was a foreign being to him; something he’d never seen before and could not decide whether or not I was a threat. “Um, no, I’ve just got tea,” he replied, and quickly fled down away from our group of beds to seek a safer place with patients who aren’t as abusive to him. It took him a moment to compose himself before he could continue on to the patient across from me and actually get his job done. Elana has taught me how to purl (the opposite of the standard knitting stitch) and how to rib, which is a mix of the knit (K) and purl (P) maneuvers. I’m still practicing, and finding I’m now trying to figure out how to correct my own mistakes instead of waiting til I next see E to show me where I’d skipped a step or let something slip by. I’m not so ambitious as to try a scarf or hat or sock or, hell, a rag, yet, but I’m still having fun with my practicing—primarily because I can see I’m making little bits of progress from each time I try. I’ve also signed up with Ravelry, the place to be for knitters, apparently. A free website which is a gold mine for anyone who knits, Ravelry is run by four people who have created the ultimate resource for anyone interested in knitting, whether they’re learning like me or they’re doing it as a day-job. I’ve got no projects set up, no patterns in my queue, and my stash noting the exact collections of yarn I’m going to use is a big bare virtual box of nothing. So far. All in good time.